The wishes of Drs Alumni of the FBM revealed! 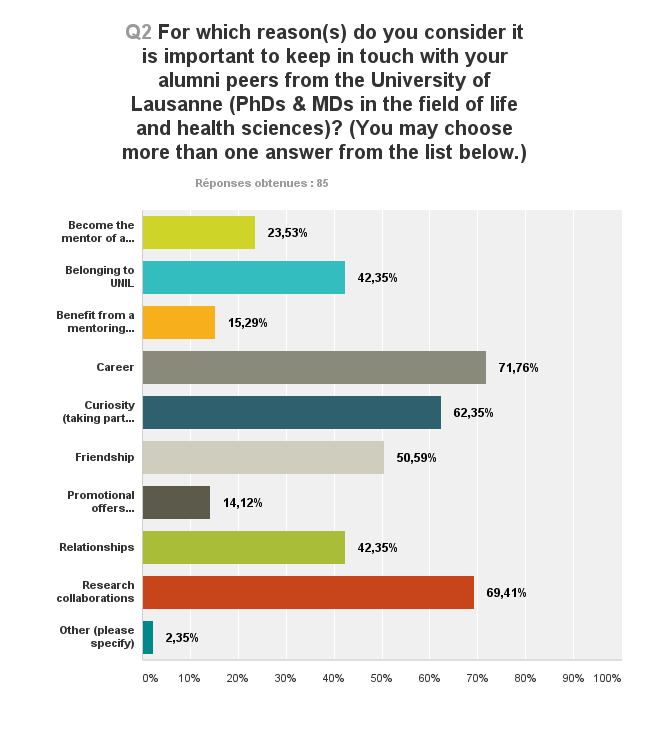 First of all, we are truly grateful to you for the time you spent on our survey “Your opinion is important to us!” Results helped us to better understand your needs and wishes regarding what we can offer to our Drs Alumni. You can now be certain that we will put all our efforts to meet your expectations. Regarding the results of the survey, we received 86 responses, which is outstanding! In order to briefly present the results, we prepared some charts for you, accompanied by a set of additional comments. 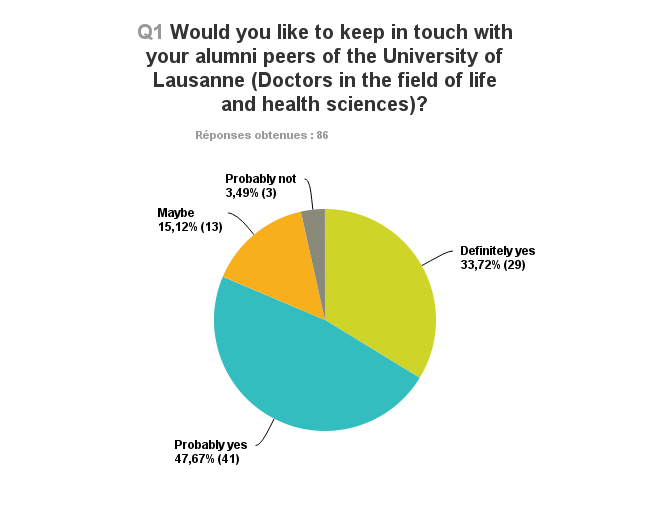 According to Question 1, a substantial majority of you would like to keep in touch with your alumni peers, which is such great news for us! 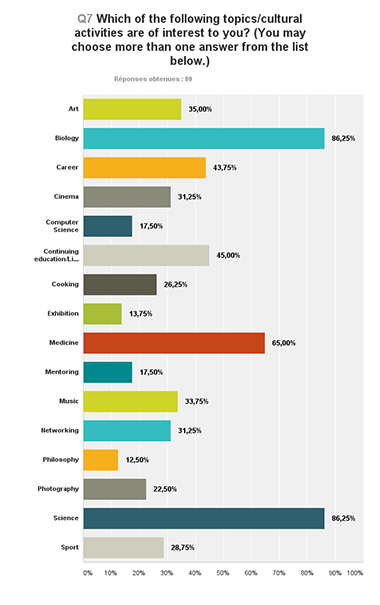 Question 2 revealed that the two main reasons to keep in touch were related to career and research collaborations. Nonetheless, your interests are broad, as you are not only interested in taking part in conferences & group activities, but are also attracted by the idea of building new relationships with your peers. We will try to find the right balance and organize formal and…less formal activities! 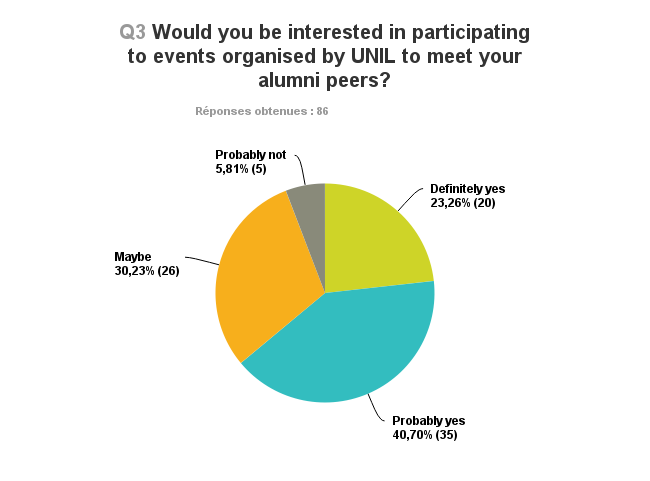 We have guessed it from Question 3: we will ABSOLUTELY organize great events for you to meet your alumni peers! We will send you invitations very soon, so stay tuned! 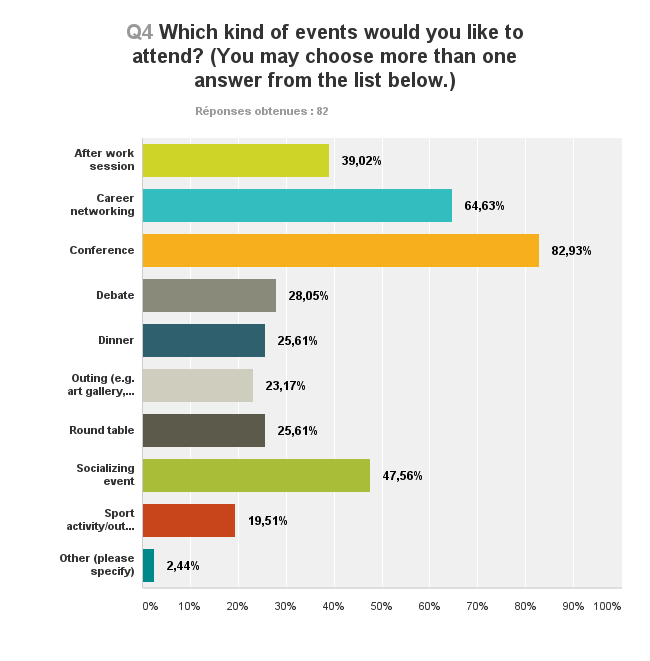 Again, you wish to stay informed and are mainly interested in attending conferences and career networking events ☺ But your interests are broad: socializing events and after work sessions seem also to be appealing to you. Lucky you! Therefore, the first event we will organize for you in March will try to include a touch of each of all these aspects! Finally, your interests are vast! But, three of them are common to all of you. Sharing equally first and second place on the podium are BIOLOGY and SCIENCE! MEDICINE has come up in third place. We will keep in mind that biology, science and medicine will always have a place in your heart :D.
← Remember the time at UNIL!